A little piece of Austrian earthy heaven. 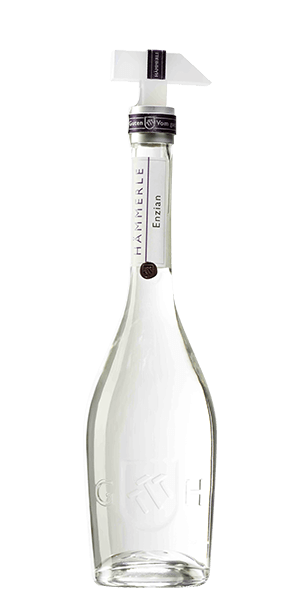 Hämmerle is an Austrian company that has been distilling and infusing great spirits for over a century—since 1885 to be precise. In fact, their Freihof Distillery has been voted Distillery of the Year by no less than the World Spirits Competition. The town of Lustenau sits in a low, fertile valley along the Rhine River. It is perfect place for growing orchard fruits — cherries and plums, but especially pears. Gebhard Hämmerle made this little spot of heaven his home. And it is these fruits that have been used by the Hämmerle Company to make their fruit spirits and brandies for generations. The German phrase "Vom Ganz Guten" as in the name, means “From the very good”. In this case 12 and a half kilograms of Gentian roots is used to produce 1 liter of Brandy. Roots were picked below the mountain tops in the Alps and deliver those earthy, leathery and smoky tones. And just wait until you see the insanely cool presentation. With a name like Hämmerle, of course you would make a custom bottle stopper shaped like a hammer. This is not your typical stage hammer, this is a smoke hammer! What does Hammerle Vom ganz Gutem Enzian Reserve taste like? The Flavor Spiral™ shows the most common flavors that you'll taste in Hammerle Vom ganz Gutem Enzian Reserve and gives you a chance to have a taste of it before actually tasting it. Sweet orchard fruits and honey. Thick, crisp, and lightly spicy with a sweet pear zing. Pear, earthy, smoky, sweet, fruit, cherry, plums, honey, spicy. Bad taste. Beets and and old dirt cellar. One of the worst bottles I've tasted from Flaviar. Smells like fresh wet dirt after a rain shower. Tastes the same. Absolutely dreadful smells like mouldy carrots and my house still has the smell. Users should know that "Enzian" is normally made from the roots of the enzian plant/flower, which grows in the alps. Those who are used to the strong taste love it and it is seen as a medicine, because of the bitter ingredients which are very healthy. Earthy plant like flavor. Couldn't finish the sample. Antiseptic smell that is unpleasant. The scent is hard to get past. Rather harsh flavor.